Saint John tells us at the beginning of his Gospel: No one has ever seen God, but the only Son who is at the Father’s side has made him known. The invisible becomes visible, the unknown becomes known. These paradoxes are at the heart of the Christian revelation. Revelation indeed means unveiling, uncovering – from the Greek verb, apokalypto. Jesus’ mission on earth was to make the Father known, to reveal the Father’s love for the world. It was a love that drove Jesus even to a cross, so much did God love the world (cf. John 3:16). But we cannot know God unless we know the neighbor. John wrote: “Beloved, let us love one another, because love is from God; everyone who loves is born of God and knows God. Whoever does not love does not know God, for God is love. God’s love was revealed among us in this way: God sent his only Son into the world so that we might live through him…. No one has ever seen God; if we love one another, God lives in us, and his love is perfected in us…. God is love, and those who abide in love abide in God, and God abides in them… Those who say, “I love God,” and hate their brothers or sisters, are liars; for those who do not love a brother or sister whom they have seen, cannot love God whom they have not seen. The commandment we have from him is this: those who love God must love their brothers and sisters also” (1 John 4:7-21). No one has ever seen God, but the only Son who is at the Father’s side has made him known…The Word became flesh and dwelt among us, and we have seen his glory, the glory of the only Son who came from the Father, full of grace and truth. John 1:14-18 is thus telling us that it’s not only on the mountain of transfiguration that Jesus revealed the glory of God. Every encounter is an opportunity for him to open our eyes to God’s love and Jesus’ glory. That’s why John also tells us, “No one has ever seen God; if we love one another, God lives in us, and his love is perfected in us” (1 John 4:12). But to see God’s glory and God’s love you have to come out from hiding. Have you ever noticed how many of the encounters Jesus had with people were intended to bring people out from hiding? To make the “invisibles” visible! 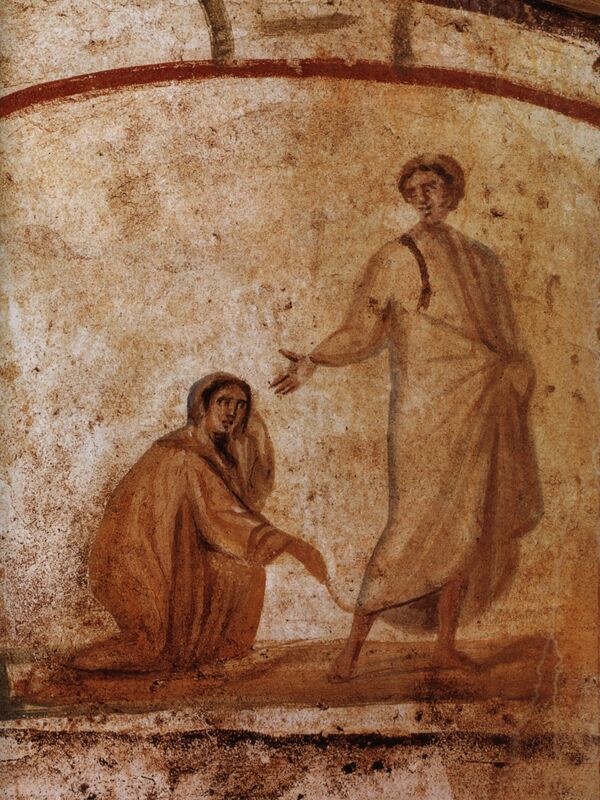 You see it in today’s Gospel reading of the woman who touched his garment. Then there was the Samaritan woman at the well. He brought the rich ruler out into the open, forced him to stop hiding behind inherited laws and tradition. He made Lazarus visible in last week’s parable. And the tax collector in another parable. He told Zacchaeus to come down from the tree. Jesus rebuked the man who hid his talent in the ground. He exposed the demons by getting them to reveal their name, Legion. Sometimes he provoked people in order to help them see the fuller reality – for example, the woman and the crumbs. How many times he exposed the thoughts of the pharisees and the others who opposed him. He wanted their thoughts out in the open! When they asked him about paying tax, he told them to look at the money they carried! Open your eyes and see what’s in front of you! And finally, there is the walk to Emmaus after the resurrection. Their eyes were opened at the breaking of bread. This is where we come in. Here in the Liturgy we also break bread with Jesus. We come out of our own hiding places and leave this Liturgy with eyes open to see as Jesus saw, and to make the invisibles visible. Categories: Sermons | Tags: commandment of love, fellowship with Jesus, Jesus calls, love of neighbor, love one another, parables of Jesus | Permalink.